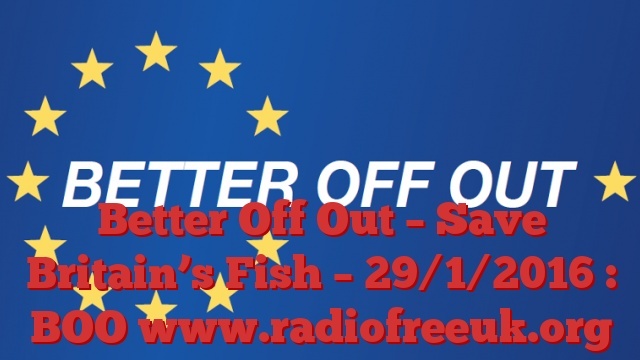 This month Better Off Out is running a campaign focussing on the disastrous Common Fisheries Policy of the European Union. We are explaining the damage done to Britain’s marine environment and to our fishing industry. We also explain how the situation would be improved if we left the European Union and regained control over our coastal and territorial waters. For this podcast Rupert Matthews travelled down to Cornwall to speak to those working in the fishing and related industries. The singing you can hear is by the boys in the Newquay Rowing Club. The first section was recorded on the dockside in Penzance where we learn about the tragedy of the discard policy. We then move on to Newlyn to talk to Ray Finch MEP, the UKIP Fisheries Spokesman, about the background to the Common Fisheries Policy and its impact on Britain. Sorry about the wind noise in places, but this was recorded on the open breakwater where Ray had been talking to local fishermen. We remain in Newlyn to speak to Truro-based chef Sanjay Kumar about his love of Cornish seafood. We accompany Sanjay to a local primary school where he teaches local schoolchildren of the importance of local seafood and shows them some easy recipes. And finally it is back to Penzance to learn abut the scandal that is known as Quota Hopping.